First mix about three tablespoons of mod Podge, and two drops of food coloring. Paint jar than sit upside down to dry. Cover leftover Mod Podge until ready to paint the next coat. Add another coat of your nixture, and let dry throughly. I added four coats of the mixture to achieve the color that I wanted. I found out that a sponge brush works better then a paint brush. It goes on smoother and leaves less lines for a more even coat. I liked how it turned out so I decided to do one in green as well. With the green I used only the sponge brush. Which went on smoother, and only took three coats to achieve the color I was looking for. What do you think? Have you tried any faux sea glass technique’s? If so I would love to hear about it. Please share in comments below. If you enjoyed this post Please share, or Pin for later! These are so pretty Linda. Great tip about using the sponge instead of a paint brush, it does look so much smoother. Thanks Michelle! I love how they turned out, and they are so fun and easy to make. The sponge did make a difference. Hi, they look great. Seeing’s it’s food colouring, how do you set it if you need to wash it? Do you bake it or is it OK how it is once its dried? Hi Barbara! No I didn’t bake it. 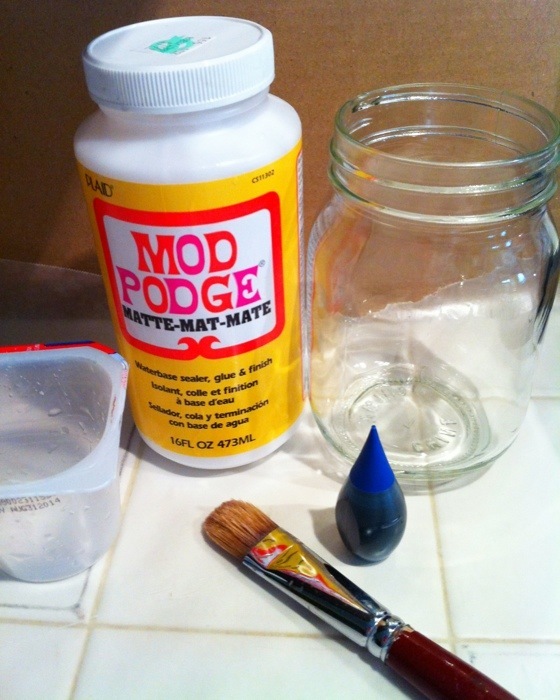 The Mod Podge drys hard, and I would just use a damp cloth and wipe it down. Hi Amanda! Yes I just let them dry on their own. No baking involved! I hope this helps, and if you have any more questions please don’t hesitate to ask. Thanks for stopping by! 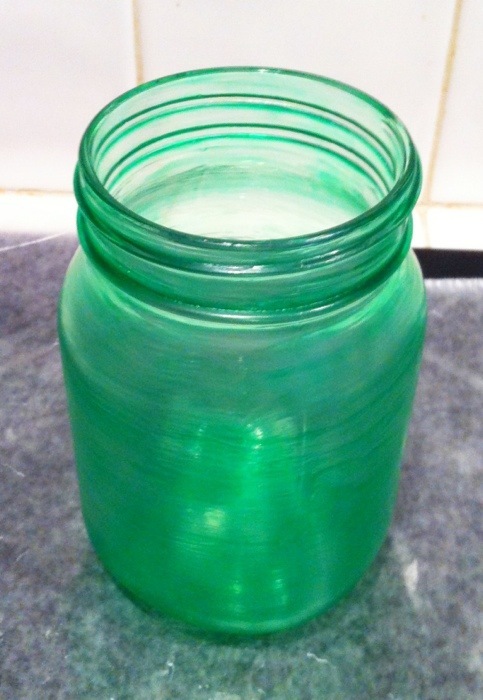 I am wanting to do this project on Earth Day for my son’s Pre-K class as a way to upcycle old jars. Do you think I could use a blow dryer on cool to help speed up the drying process so we can get all the layers on while I’m there? Hi Allison! That sounds like fun, I’m sure they would enjoy that. I think that using a blow dryer would work just fine! Those colors are fantastic. What are you going to do with them? I took these to the craft mall for my booth. I absolutely love how the finish product looks. 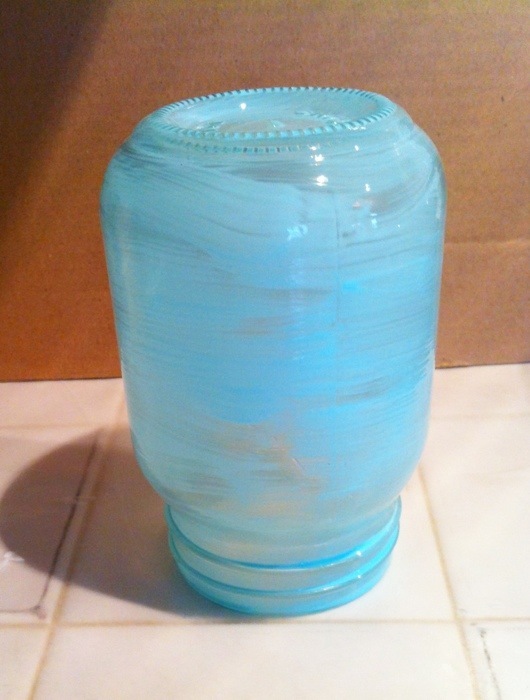 I have a clear glass project that I would look to apply this same method using white. Do you have any suggestions of what I can use since I can’t get white food coloring? Hi Angela! You may try just a little bit of white acrylic paint. Let me know how that works, I’ve never thought of using white. Folk Art makes an enamel version of white. 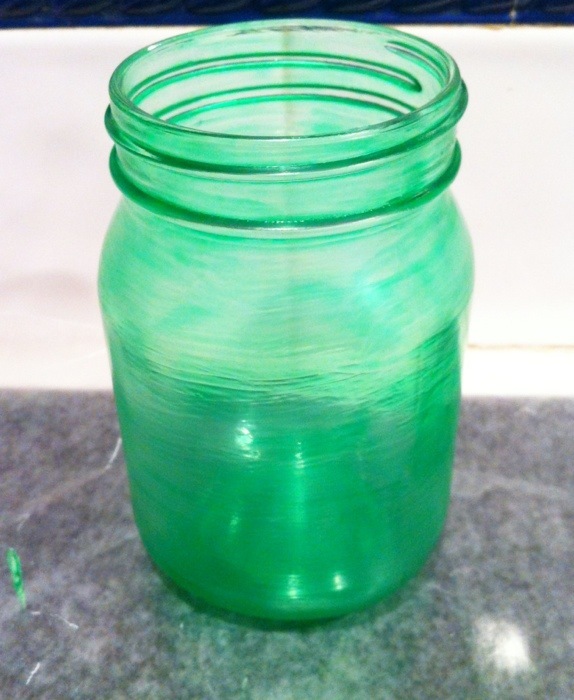 I use it when I paint roses on jars or vases, etc. The paint dries very well after a few days but it can also benefit from some time in an oven; however, I never put my art in the dishwasher. I’m too fearful of that. Hi Sondra! I will have to look for the folk art enamel version. I haven’t ever put any of my jars in the oven. I will have to look into that technique. Thanks for stopping by! Hi Tonia! No I wouldn’t advice painting the inside if you are going to add liquids, or any consumable items. 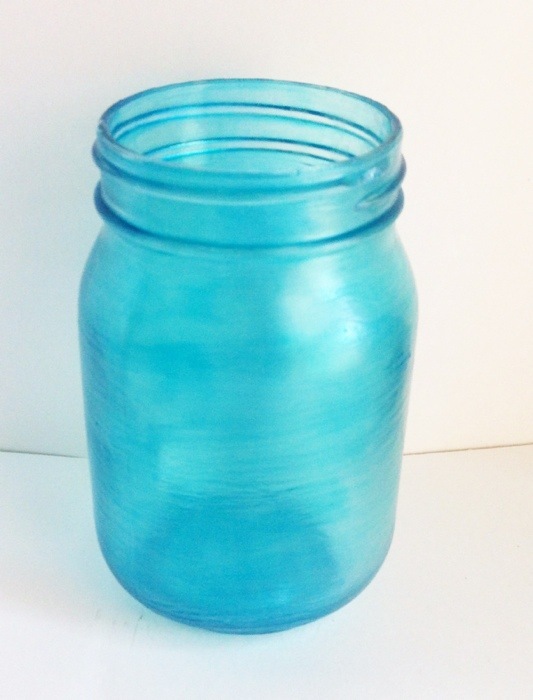 You could paint the outside like I did on these faux sea glass jars though. Hope this helps. If you have anymore question please don’t hesitate to ask. 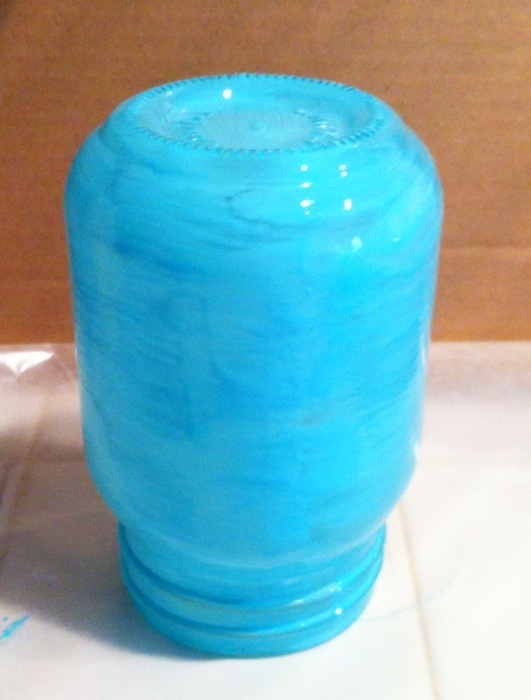 I thought these jars came out incredible- I saved a bunch of large jar candles, that I completely cleaned all the wax out of, I want to make into jars for the bathroom w/ labels u make out of tape it’s cool the words come off on the jar/ not the tape I saw on Pinterest & I have a blue beach theme so I’m going to do the blue on the hard. I’m going to put felt on the bottom. So glass jars & porcelain counters don’t smash. Thanks for great tip, and great idea to use some of those whole basket of candle jars. Those will be so pretty Tina! I have seen the labels made with tape, and it looks like it would be so easy. I haven’t got to try it yet but want to give it a try sometime. 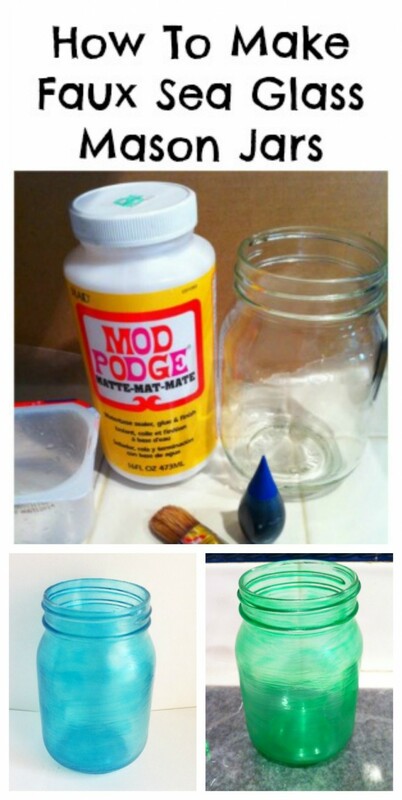 Adding felt to the bottom of the jars is a great idea! can you swirl different colors of food coloring? I haven’t tried that, I will have to sometime. Linda I definitely need to try this. 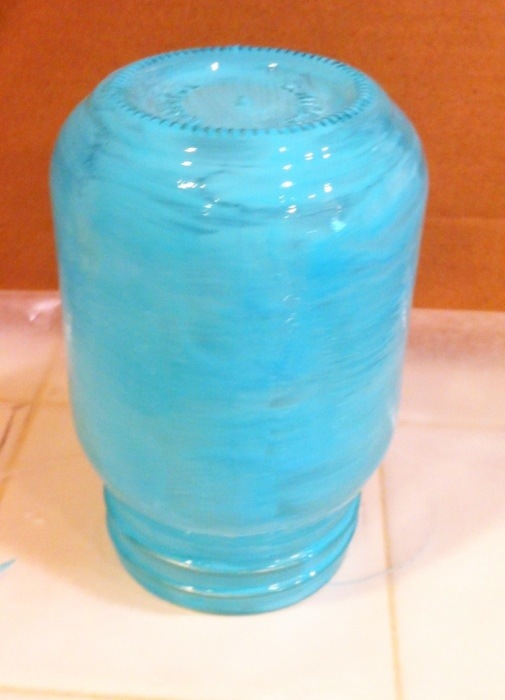 I need more blue jars in my life now that I’m going through blue beach and skies withdrawal! Haha! I bet you are Mary! I would love to see what you come up with. I’m sure it will be amazing! Hi Linda, this is my first time trying to paint a seagrass cake stand. I only painted the bottom of the plate and the stand. How long do I let it dry so as not to see the brush or sponge marks? Hi Cece! It should be dry within an hour, but I don’t know that the brush marks will go completely away. I don’t suggest putting it in water to clean. Just use a damp cloth to wipe down. You know, there is a mod podge that is dishwasher safe after it cures for 28 days. I use it on painted jewelry pieces. That would be my choice for this craft! I have some old lightbulbs I’m wanting to paint and use for garden decore. Would this tecnique work if I used a sealer over the painted glass? Hi Judy! I would think that if you used an outdoor sealer it would be fine. You may need to seal it once or twice a year.